After publication of Western Massachusetts Families in 1790 in book form, the project continues as a database on AmericanAncestors.org and is becoming a more and more useful resource. While there were some 14,171 households listed in Berkshire and Hampshire Counties in 1790, one might think there would be few connections between the almost randomly distributed sketches in the project. But there are. Just the other day, in a sketch of Joseph Brown, I recognized his daughter Freelove’s husband, William Jenks, as a child in the sketch of Edmund Jenks, published online several months ago. And this is not the first time that’s happened. A great value of these sketches is that the authors often had unique sources in their possession: family Bibles, old correspondence, and often genealogical research done by their forebears. Land and probate records and Revolutionary War pensions add more color. 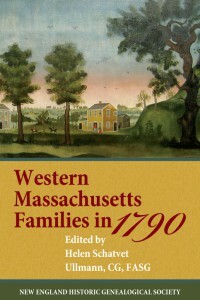 The sketches usually connect families left behind in Massachusetts with groups that emigrated, usually west to New York and beyond, but sometimes north to Vermont and occasionally Canada. When the project was announced, NEHGS received about 250 sketches! As I edit them, authors often ask if they can submit the family of someone closely related. Of course we are not about to turn them down, even though they’re kind of jumping the queue. But anyone who is wondering whether the sketch they submitted is ever going to appear could email me at hsullmann@comcast.net.